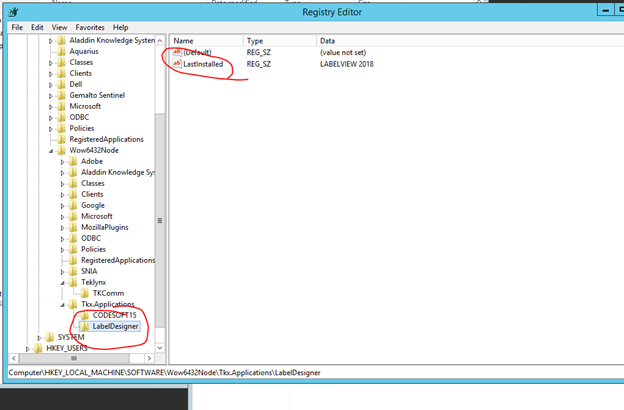 This Reference Article defines and explains the topic of “How to install 2018 Version of CODESOFT and LABELVIEW on the same computer”. Initial releases of the software do not allow both program to be installed on the same computer. 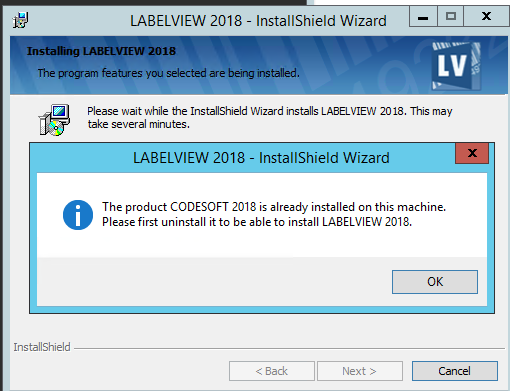 With the release of the 2018 versions of CODESOFT and LABELVIEW, we discovered that we are unable to install both program on the same computer. This is not likely to have major impact to our customers but it impacts us in our ability to support our customers. When we attempted to install the program (after the other one is already installed), we would get an error message. The picture below shows the message when trying to install LV after CS is already installed. We are not certain of Teklynx’s reasons behind this decision. However, we’ve found a way to force the program to be able to installed. We need to delete one Key from the system registry. Computer\HKEY_LOCAL_MACHINE\SOFTWARE\Wow6423Node\TkxApplications\LabelDesigner Once the key is deleted, you would be able to install the program. Note: We are not sure if both programs (CS & LV) will perform normally after the installation as we do not know the reasons for not allowing them to be installed together.